THE WRITING BUDDHA - Opinions | Books | Movies: 23½ Ways to Make A Girl Fall For You by Cyrus Broacha (Book Review: 3*/5) !!! 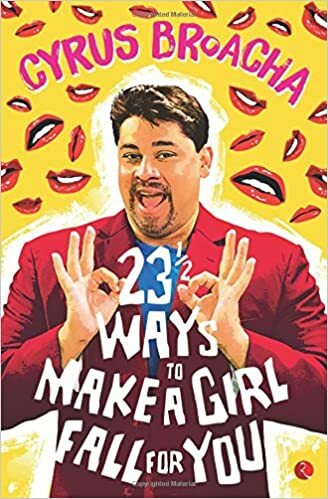 23½ Ways to Make A Girl Fall For You by Cyrus Broacha (Book Review: 3*/5) !!! Reading a humorous book is always a stress-buster and when it's written by someone witty like Cyrus Broacha or Twinkle Khanna, the excitement to read those witty lines make you turn page after page so quickly that you end up finishing the read within 3-4 hours. The same happened with me when I picked up Cyrus Broacha's latest release "23 & 1/2 Ways to Make a Girl Fall For You". Though this is not one of the best works of Cyrus but as he is known for being that agony uncle who gives advise to anyone who is not able to find love or date a girl, this book is a must-read. The book is full of letters that normal Indian guys have sent to Cyrus for asking a tip, suggestion or asking to motivate them about how to propose or approach a girl. Cyrus knows that it's hard to explain the Indian men that the girl will never say YES to them so rather than giving a challenging response, Cyrus starts sympathizing with the readers in his reply. And that's where the fun begins. Also when in few cases he gives advise and let the man know that he is not wrong on his part, that becomes more hilarious. The references that Cyrus gives in his reply of other topics and situations is damn hilarious and this is what makes this guy special. Right from his BAKRA days to now, the guy have not stopped impressing us. In few letters, I did feel that the letters to Cyrus sounded really fake because of their length and the way the grown up guys showed innocence. Cyrus should have scripted those letters with little more reality than doing it just for humorous purpose. This is the only problem that I had from this book where the letters were as long as 2 and a half pages sometimes. It became exhaustive then to continue reading that letter as you already know the end result of it. Also, in some of the responses, Cyrus did sound as if he was trying to be humourous and it wasn't coming it to him naturally. Otherwise, this book should be read in breaks because the letters and the reply becomes monotonous for the readers after sometime and you will stop enjoying it in the middle of it. I give this book 3 stars out of 5.